The Matthews Car Mount Kit is designed for prosumer lightweight video cameras and camcorders, as well as for professional videographers and 16mm cinematographers. Vacuum cups employ the force of atmospheric pressure to grip the surface. The vacuum cup's pump features a plunger with a red line, which serves as a vacuum indicator. 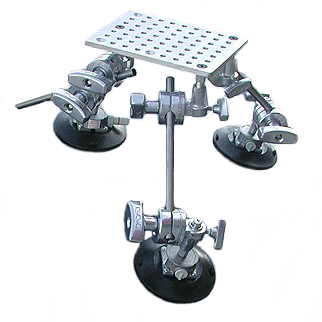 Includes three suction cups, three gobos/arm sets, and a cheese plate. Does not include head. (3) 15mm Steel Rod @ 12"